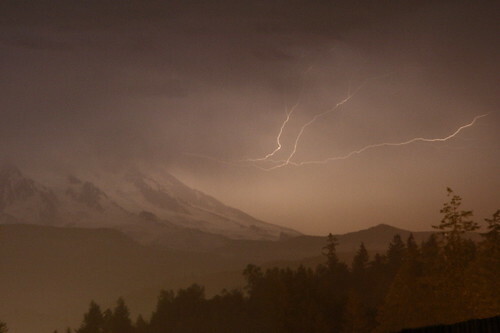 Lightning over Mount Rainier, originally uploaded by The Bacher Family. The night before Independence Day a few years ago, nature entertained us with its own fireworks show, including lightning over Mount Rainier east of town. I took this photo from my front yard, with a long exposure on a tripod. This was the best of several photos I captured; I could have gotten even better images if I had been willing to take the risk, because the lightning increased after I got this picture, but the storm also moved overhead and I didn't want to get struck myself!